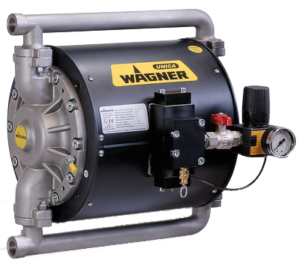 Best finishing results with a clear cost saving – with the double diaphragm pump WAGNER TOPFINISH DD10 for supplying manual and automatic Airspray guns. It can be used, for example, when staining wooden furniture, coating metal parts, and applying chrome paint to plastic parts. Double diaphragm pump for AirSpray applications. 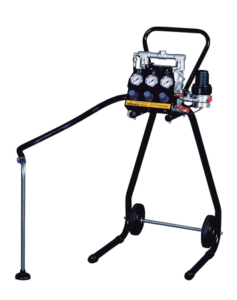 Including material pressure regulator with integrated filter and suction hose/frame. Materialpressure up to 8 bar. Suitable for one or several guns. 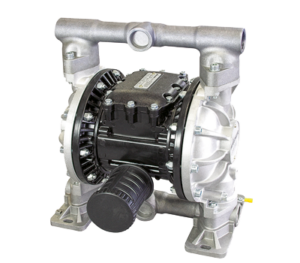 Double diaphragm pump for AirSpray applications. 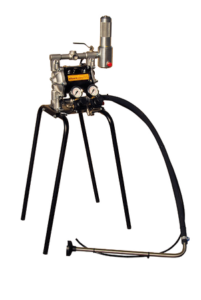 Cost effective entrylevel model without material pressure regulator. Nevertheless, offers low-pulsation thanks to large material filter. For pressures up to 8 bar and one gun. 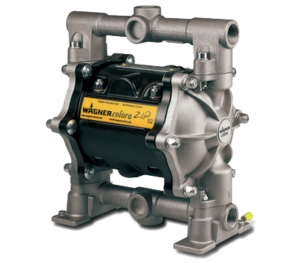 Double diaphragm pump 4.5:1 for product transport and circulating systems. For pressures up to 27 bar and 8 L/min. 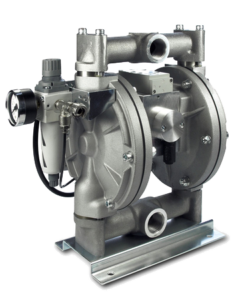 Double diaphragm pump for material transport and circulating systems. Up to 8 bar and 52 L/min. 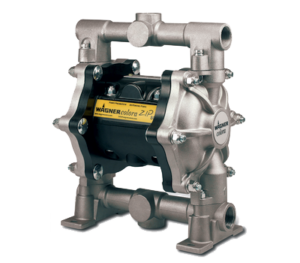 Double diaphragm pump for material transport and circulating systems. Up to 8 bar and 28 L/min. Double diaphragm pump for material transport and circulating systems. 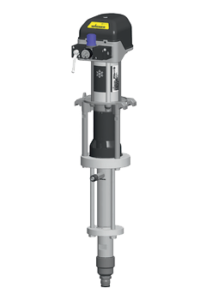 Up to 8 bar and 80 L/min. Double diaphragm pump for material transport/conveying and circulating systems. Ideal for lacquer supply. Up to 8 bar product pressure. 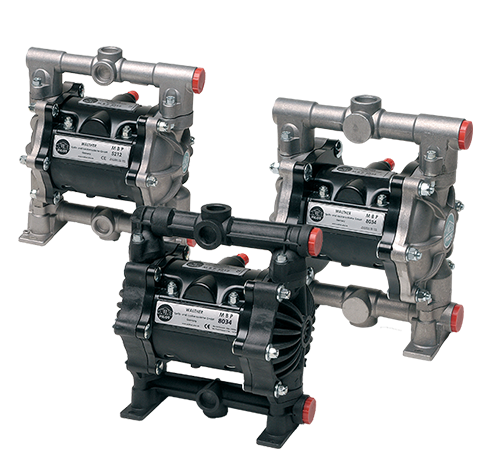 Double diaphragm pump for material transport and circulating systems. Up to 8 bar and 182 L/min. 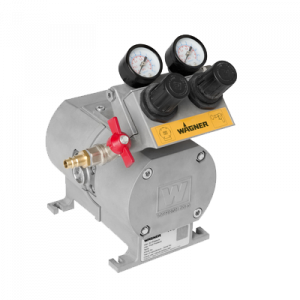 Low-pressure feed pump for Airspray applications with high-viscosity material or long hose lines. Up to 40 bar and 3.6 L/min. Low-pressure piston pump on drum suction system, without air pressure regulator and without filter antipulsation tank. 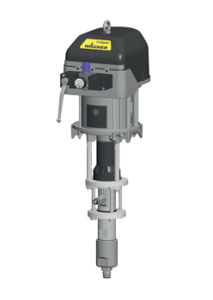 Low-pressure piston pump, stainless steel for feed and circulating systems up to 15 L/min. 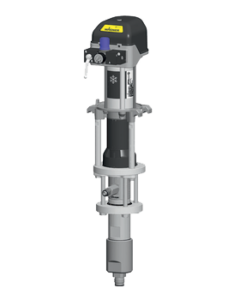 High-pressure, double diaphragm pump, Consistal. 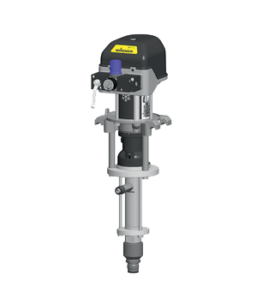 For AirCoat and Airless applications up to 2.5 l/min and 250 bar. Ideal for everything from the individual lacquer station to complex multi-paint systems. High-pressure piston diaphragm pump. Universally applicable for aggressive, abrasive, and shear-sensitive materials. Extremely low flushing agent consumption. 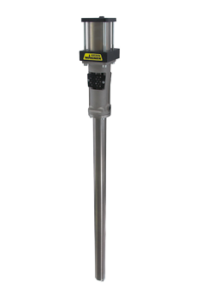 For all applications up to 250 bar and 5 L/min multiple gun use. High-pressure piston pump, stainless steel, for Airless and AirCoat applications up to 320 bar and 0.9 L/min. Ideal, for example, for professional single-item lacquer stations in production and in workshops. 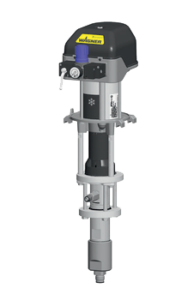 High-pressure piston pump, stainless steel, for Airless and AirCoat applications up to 160 bar and 1.8 L/min. Ideal, for example, for professional lacquer stations in single-item production and for workshops. High-pressure piston pump, stainless steel, for AirCoat applications to 140 bar and 2.4 L/min. Ideal, for example, for professional single-item lacquer stations in production and in the workshop. High-pressure piston pump, stainless steel, for Airless and AirCoat applications up to 220 bar and 2.4 L/min. Ideal, for example, for professional individual lacquer stations or as a hardener pump. 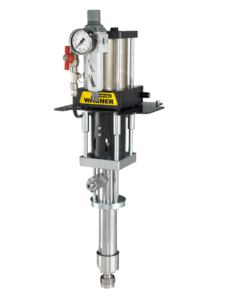 High-pressure piston pump, stainless steel, for AirCoat applications up to 120 bar and 4 L/min. Ideal, for example, for industrial coating in the wood and metals industries. 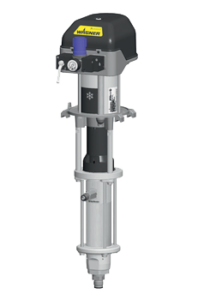 High-pressure piston pump, stainless steel, for AirCoat applications up to 168 bar and 6.6 L/min. Ideal, for example, for multiple guns in a flatbed machine. 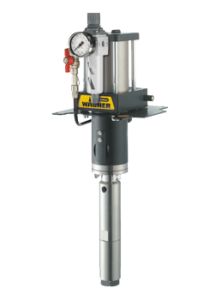 High-pressure piston pump, stainless steel for AirCoat applications up to 120 bar and 9 l/min. Ideal for e.g. industrial coatings in the wood and metal industries, use of multiple guns. 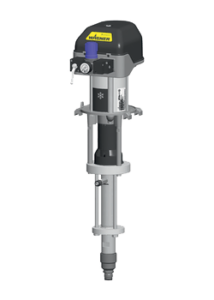 High-pressure piston pump, stainless steel for Airless and AirCoat applications up to 250 bar and 4 l/min. Ideal for e.g. industrial coatings in the wood and metal industries. 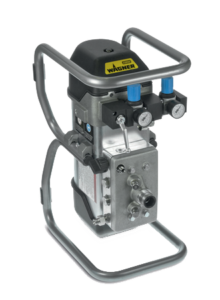 High-pressure piston pump, stainless steel, for AirCoat applications up to 138 bar and 15 L/min. Ideal, for example, for industrial coating in the metals and plastics industries and the use of multiple guns in fully automated lacquer systems. 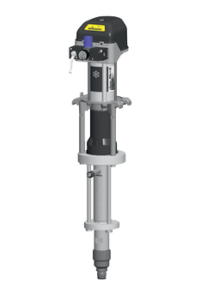 High-pressure piston pump, stainless steel, for Airless and AirCoat applications up to 270 bar and 15 L/min. Ideal, for example, for the use of multiple guns in automated lacquering systems with a large throughput. 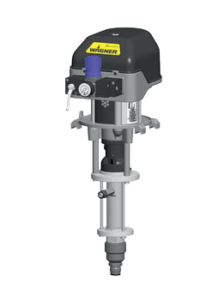 High-pressure piston pump, stainless steel, for Airless applications up to 370 bar and 6.6 L/min. Ideal, for example, for industrial coating in the metals industries and for smaller protective coating applications, long hose lines. 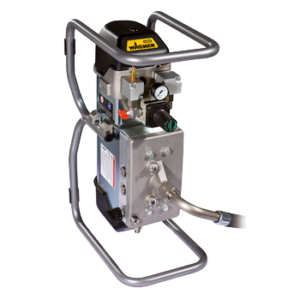 High-pressure piston pump, stainless steel, for Airless applications up to 440 bar and 12 L/min. Extremely robust and ideal for heavy corrosion protection. High-pressure piston pump, stainless steel, for Airless applications up to 480 bar and 7,2 L/min. Extremely robust and ideal for heavy corrosion protection. High-pressure piston pump, stainless steel, for Airless applications up to 530 bar and 12 L/min with critical material. Ideal for thick coat corrosion protection with large material application, multiple gun use. Industrial grade pumps of all types for any application. Multiple lines at all price points to match up perfectly with your application, no matter the scale.